Experience easy living while staying at this 1-bedroom, 1-bath vacation rental situated on Redwater Lake, just 6 miles to Hawthorne and 23 miles to Gainesville. Sleeping 4 with 900 square feet of newly remodeled living space, this home sits on 2 acres of private lakefront property. When you're not swimming, fishing, kayaking or canoeing, discover Paynes Prairie State Park, the Florida Museum or University of Florida. Approach this outdoor oasis down a long dirt road in the Florida countryside and enter through the home’s immense yard, which borders 30 acres of marshy wild land. Sleek tile flooring, comfortable furnishings, and warm natural light greet you the moment you set foot inside this well-appointed interior. After your travels, settle down on the plush seating in the open-concept living area. Gather as a group as you watch your favorite show on the large flat-screen satellite TV. 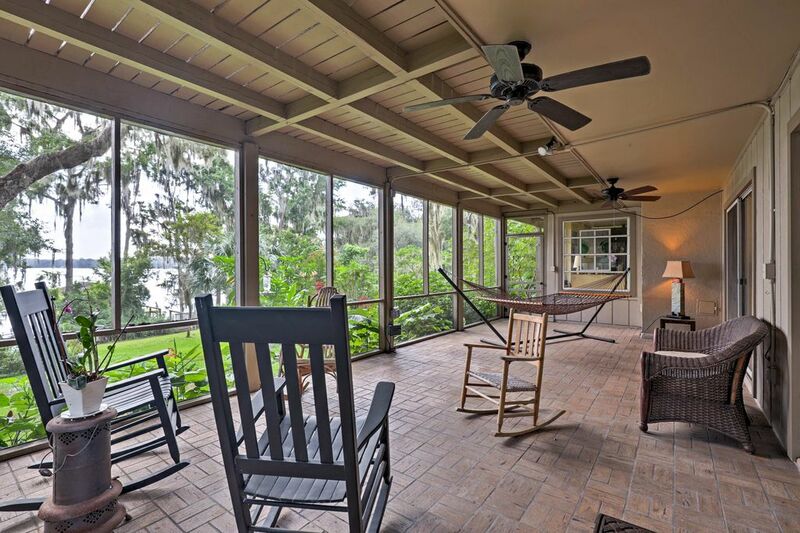 You're sure to spend quality time on your private screened-in porch, which overlooks the lake and sylvan setting. Whip up some cocktails for the group and walk down to the shared dock and 200-square-foot boathouse, offering a provided kayak, canoe, paddle and life jacket. When everyone has worked up an appetite, make your way into the stunning fully equipped kitchen, complete with granite countertops and stylish cabinetry. Set the formal dining table with seating for 4 to share in your culinary creations! As your eyes begin to grow heavy, retreat to your master bedroom outfitted with a lustrous king-sized bed, sleek hardwood flooring and an en-suite bathroom. When the others are ready to turn in, 2 other guests can climb under the covers of the additional futon. With 2 acres of property on Redwater Lake and easy access to swimming, fishing, and kayaking, you may never want to step foot off the property! That said, Hawthorne and Gainesville are brimming with outdoor adventure for those wishing to explore! Start the adventure just 30 minutes from your door at Florida's first state preserve, Paynes Prairie Preserve State Park where you'll find a 21,000-acre savanna and rich wildlife, including alligators, bison, horses and nearly 300 species of birds. Whether you're visiting a kiddo at college or just looking to enjoy the excitement of a big game at Ben Hill Griffin Stadium, the University of Florida is conveniently just 30 minutes away from this apartment! Before heading home, try Gainesville eatery favorites like The Top, Satchel's Pizza and Harry's Seafood Bar & Grille. For more fun for the whole family, make the 27-mile drive to explore The Butterfly Rainforest at the Florida Museum of Natural History and the Samuel P. Harn Museum of Art. We just loved it. Glynn and Julie were so gracious and their pets Molly and Elvie were the sweetest dogs you’d ever want to meet. The view was picture perfect and the home itself was very nicely furnished, comfortable king size bed and decorated very tastefully! I’d go back in a minute, as a matter of fact we are already planning for next year! Can’t recommend it highly enough. The place was very nice and the hosts were great. My only recommendation would be to arrive during daylight hours as the road to the place is a little tricky in the dark. Right on the lake. Beautiful flowers. Lots of birds. Lots of hiking and biking trails in the area. Sitting in the rocking chair in the screened in porch was great in the early morning or at the end of the day. Very nice and quiet place. Great people too!! We thoroughly enjoyed our stay. The apartment was comfortable, well stocked,and tastefully decorated. The property is beautiful, private and very relaxing. We would definitely rent this property again. It is a great place to get away from it all.